It feels a little odd to be advocating concerts that I’ll never attend in promotion of an album that is unlikely to be released in Australia, but since Paul Heaton is afraid of aeroplanes and unlikely to tour here any time soon I have to live vicariously to get my Heato-related kicks. Mr Heaton will be promoting Acid Country with his second solo tour of 2010 and, as I said back in June, those attending will be chuffed to know that Paul has been playing a few Housemartins songs in his set for the first time in over 20 years. 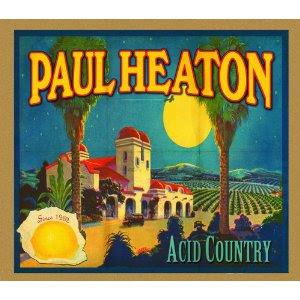 The Acid Country tour starts in Liverpool on the 20th September, winding up in Wexford, Ireland on the 8th October. Tickets are available now from gigsandtours.com. Enjoy it you lucky swines. Elsewhere Heaton is also the support for the evergreen Madness on their Do Not Adjust Your Nut tour from 26 November to 17 December. Madness were surprisingly wonderful when they toured Australia 18 months ago, so that's not a bad bill, even for a bit of a nostalgia show.